The durable CETEWAYO is a multiple Grade 1 winner and earner of $1,170,258. He was campaigned under the colors of Dr. John Chandler and trained by Michael Dickinson during his lengthy career, which concluded at the age of ten. 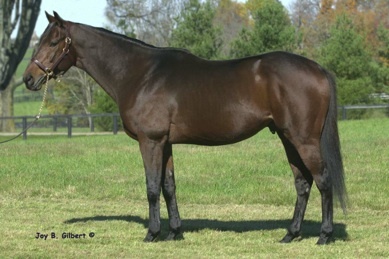 An eight time stakes winner, he also placed in eight stakes which were all graded. He established a new course record at Arlington Park in the Stars and Stripes Breeders' Cup Turf (G3) covering 12 furlongs in 2:27.5 bettering a track record that had stood since 1964. CETEWAYO is a half sibling to no less than six stakes horses being out of profile producer Aletta Maria. CETEWAYO is by His Majesty and will provide a great source of Ribot and Hyperion, which hails top and bottom in his pedigree, to breeders in the Mid-Atlantic region. A great source of soundness and stamina, CETEWAYO showed brilliance and a great turn of foot while competing at the highest level as was shown by his wins in the Sword Dancer Invitational (G1) at Saratoga and the Gulfstream Park Breeders' Cup Handicap (G1). His win in the Gulfstream Park Breeders' Cup Handicap (G1) made him the third horse in North America history to win a Grade 1 race as an eight year old.